Steroids, though not always sustainable, are the standard first-line treatment for idiopathic thrombocytopenic purpura (ITP), followed by immunomodulatory (IMiD) treatments and thrombopoietin mimetic stimulatory agents, explained Abhinav Deol, MD. Moreover, the goal in treating patients with ITP, explained Deol, is to return patient platelet counts to as close to normal, or safe enough, levels to prevent the risk of bleeding to critical organs. “Overall, if you can [achieve this], patients can have a normal life expectancy,” said Deol. Following the 2008 and 2014 FDA approvals of the bone marrow stimulants romiplostim (Nplate) and eltrombopag (Promacta), respectively, the most recent second-line agent to enter the field is the SYK inhibitor fostamatinib (Tavalisse). 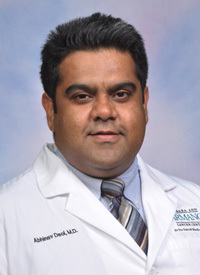 In an interview with OncLive®, Deol, assistant professor of oncology, Division of Hematology and Oncology, Department of Oncology, Wayne State University School of Medicine, Karmanos Cancer Institute, discussed the presentation and prevalence of ITP in addition to the current and emerging therapeutic strategies that are used to manage the disease. OncLive: How does ITP present and who is most likely to be diagnosed with the disease? Deol: In its name it says idiopathic, so we don't have a clear-cut cause in terms of the low platelet count, which leads to increased risk for bleeding. Sometimes this can happen after patients have been exposed to certain drugs. This might stimulate their immune system to target normal cells like platelets. Usually, it is a diagnosis of exclusion. You want to make sure there are no other abnormalities that are leading to low platelet counts including autoimmune diseases and other problems that can coexist. We diagnose someone with ITP if there is no evidence of any other existing condition and there are no infections that can explain the low platelet count. The treatment for this has been evolving over the last few years. The cornerstone of treatment was immune suppression with steroids or immunoglobulins, though that is usually not something that is sustainable for a long period of time. Steroids have their own adverse events. Immunoglobulin responses usually last for a short period of time. That is where other treatments, such as rituximab (Rituxan), have been used in this setting. We also have thrombopoietin mimetic stimulatory agents, such as eltrombopag and romiplostim, that have been approved. More recently, there is a SYK inhibitor that was approved for use in patients with ITP who don't respond to other IMiD approaches. What is the prevalence of ITP? It's not something that we see very commonly, but it does happen. There is a slight female preponderance. Some of the developing countries have also shown that there might be a coexistence with some common infections. Some European studies from Italy looked at common pathogens that cause acid reflux, which might be associated with ITP incidence. Overall, it's a disease that happens less frequently than some of the other hematological problems that we see. When it is diagnosed, there are treatment options available. The goal is not to get the platelet count back to normal but to get it to a safe level, so patients don't have risk of bleeding into a vital organ. What do the survival outcomes look like for these patients? It depends on whether patients respond or not. There are patients who, after a course of steroids, will have their counts return to close to normal. They can be tapered off steroids and do well long-term. If you look at overall incidence, it's more commonly seen in children or younger adults. It becomes harder to treat in older patients because of comorbidities. [In those patients], steroids might not be something they can tolerate. Patients who have either chronic forms of ITP or don't respond [to therapy] are those who have an increased risk of bleeding and shortened life expectancy. What are the differences between the available therapies? The initial treatment still consists of steroids. We use rituximab as a potential option for treatment. Splenectomy can be evaluated as an option, especially in younger patients who are healthy enough to undergo splenectomy safely. There can be sustained responses with splenectomy. One of the thrombopoietin mimetic stimulatory agents is an injection and the other is an oral therapy. Where the patient lives and how convenient it is for them to get injections versus oral therapy helps determine what the appropriate treatment choice is.